"This base has been sealed for a reason." RLJE Films has released an official trailer for the zombie horror film Trench 11, which premiered at the Toronto After Dark Film Festival last year and has been playing at various genre film festivals since then. The zombie horror is set in the final days of WWI, following a shell-shocked soldier who must lead a mission deep beneath the trenches to stop a German plot that could turn the tide of the war. This is brutal and bloody and violent and exactly what you might expect for a film about WWI bloodthirsty, worm-infected zombie soldiers. Trench 11 stars Rossif Sutherland, Karine Vanasse, Charlie Carrick, Shaun Benson, and Ted Atherton. This trailer takes a bit of time to build, but finally gets into the gnarly, freaky horror stuff, though they don't show much of the ensuing gore. Tread carefully. In the final days of WWI a shell-shocked tunneller leads an Allied team into a hidden German base… 100 hundred feet below the trenches. The Germans have lost control of a highly contagious biological weapon that turns its victims into deranged killers. The Allies find themselves trapped underground with hordes of the infected, a rapidly spreading disease and a team of German Stormtroopers dispatched to clean up the mess. The only thing more terrifying than the Western Front… is what lies beneath it. 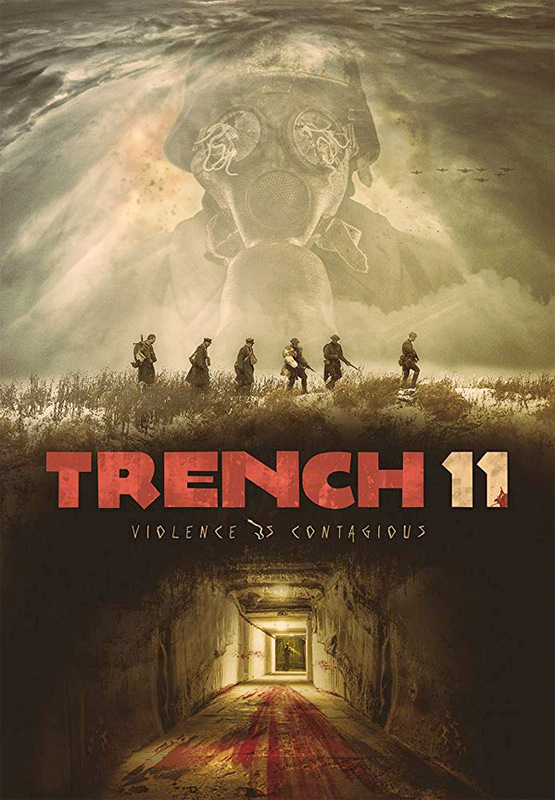 Trench 11 is directed by English filmmaker Leo Scherman, director of the films White Knuckles and Never Forget previously, and some TV series. The screenplay is also written by Matt Booi and Leo Scherman. This first premiered at the Toronto After Dark Film Festival last year, and played at numerous other genre festivals last year. RLJE will release Scherman's Trench 11 direct-to-VOD starting September 4th coming up soon. Anyone down?